Big screen adaptations based on young adult book series are a hot commodity in Hollywood right now. Some of them have been hugely successful like Harry Potter, The Hunger Games, and Twilight. Other like Beautiful Creatures, The Mortal Instruments, and Vampire Academy have not left a lasting impression on moviegoers. Divergent is the next film in this sub-genre hoping to have a massive appeal. It is based on the first book in a series of three by Veronica Roth. It stars a slew of talented up and coming actors like Shailene Woodley (The Spectacular Now, The Descendants), Theo James, and Miles Teller (That Awkward Moment). The supporting adult characters boast the well-known faces of Ashley Judd (Kiss the Girls), Tony Goldwyn (“Scandal”), and my Kate Winslet (Titanic). In a post-war dystopian Chicago, the city has been divided into five sections, known as factions, based on people’s virtues and aptitudes. They include: Abnegation (selflessness), Amity (peacefulness), Candor (honest), Dauntless (bravery), and Erudite (intelligence). People are born into the factions of their family, but once a year a ceremony is held where those that are sixteen years old can take a test to see which faction they belong in. 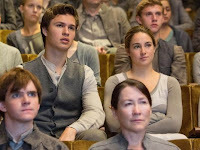 They have the choice to stay with their family or transfer to a new faction based on the results of their aptitude test. Beatrice (Woodley) and her brother Caleb (Elgort) take their tests on the same day and their results could affect their family forever. Beatrice’s aptitude test scores come back showing she has strengths in all five areas. This rarity is considered a danger and threat to the government and society as a whole. These people are considered Divergent. She is warned to keep her test results a secret from everyone including her parents (Judd and Goldwyn) and claim they came back as “inconclusive”. On the day of the ceremony, she chooses to be a part of the Dauntless faction leaving behind her brother and parents. 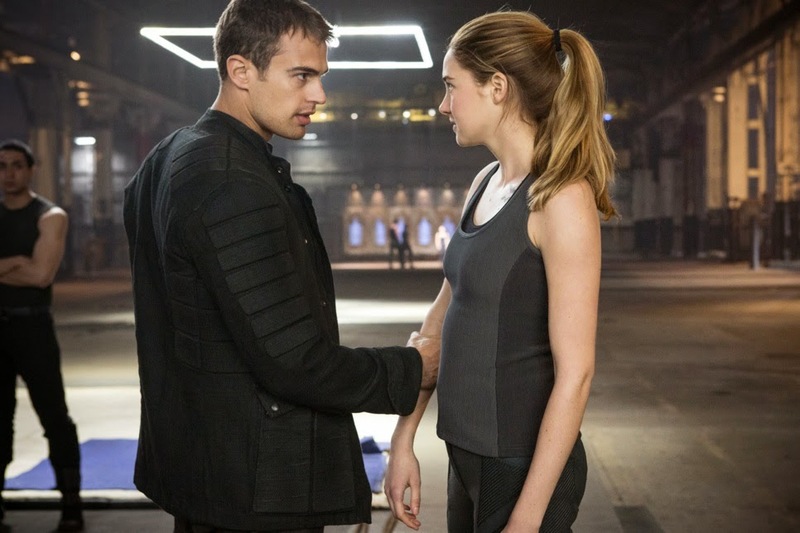 She changes her name to Tris and immediately begins the physical training side of the initiation. 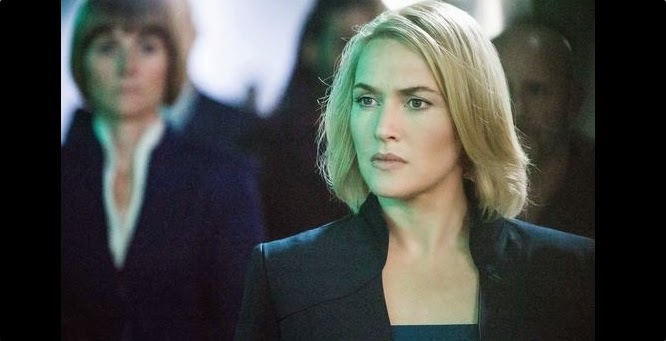 In the meantime, Jeanine (Winslet) the leader of the Erudite faction searches for those that are Divergents that pose a threat to the order and structure of society. I will have to admit that I have only read a third of the book so far. Fans of the book should be happy as it seems to be a pretty faithful adaptation. There are small minor changes along the way, but that is expected. Without knowing how the rest of the book plays out, I did question some of the pacing and structure of the events in the film. The ceremony happens very early on in the film and then we get right into Tris’ training which feels like it takes up a majority of the film. I kept wondering if and when would we see the actual conflict of the story play out. Was the first film going to be all set up and exposition leading up to the second film? Kate Winslet’s icy character does come back into the picture to stir up some trouble and gets the ball rolling again, but it could have happened faster. The training is important as it brings out the shift in character for Tris, but it feels like too much of the film is devoted to that. Maybe the original source material is to blame for that. The training is where we meet Four(James), a trainer that takes Tris under his wing. Sure enough she starts falling for him and a romance ensues before the end of the movie. So much of the story was about Tris becoming a strong, brave, and tough girl that I was determined that they weren’t going to throw a love story in here. I was getting excited that Veronica Roth wrote a young adult series that didn’t go down that path. I was wrong. Naysayers may pick it apart and try to draw comparisons to the likes of the Harry Potter or The Hunger Games series. Yes, it is easy to see similar actions and character types along the way. I would give Divergent credit for being the most realistic of these three series. 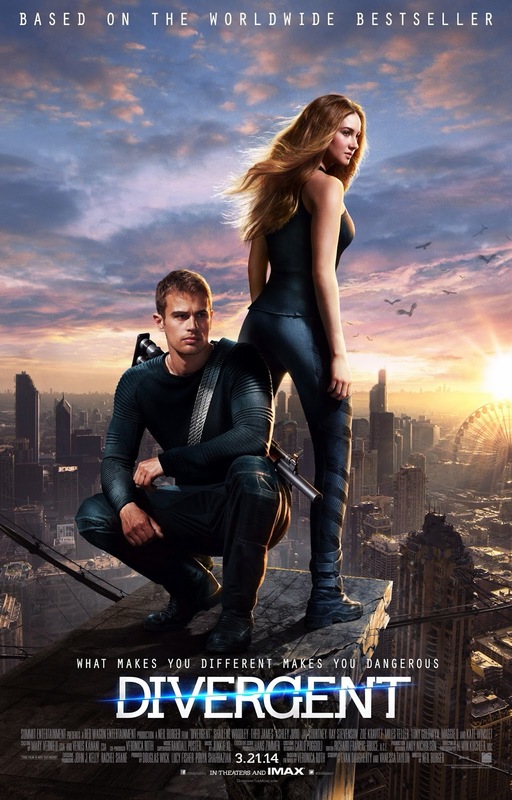 Tris is a great role model for any young girl reading the series or seeing the film. She isn’t one to give into pressure. She stands up for herself and faces her fears and demons. 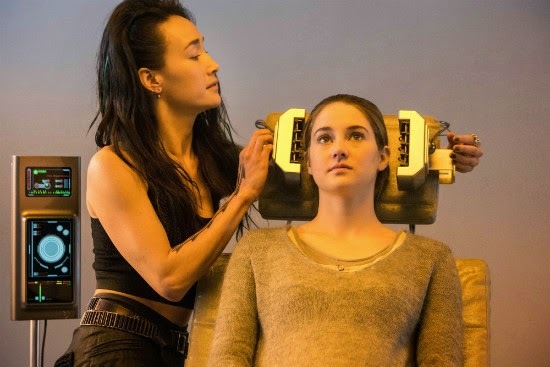 Shailene Woodley brings out the soft, innocent side of her of that is needed for the beginning of the story, but can easily take her through the changes Tris goes through during her initiation. Ansel Elgort has a minor role here as Tris’ brother, and will also star with Woodley in the summer’s highly anticipated The Fault in Our Stars. This is the first time Kate Winslet has portrayed a villain. She takes the less is more approach to playing out the cold and evil demeanor that her character embodies. I have been a massive Kate Winslet fan dating back to Titanic, and it’s great to watch her play someone different. She keeps Jeanine realistic without making her cartoonish or diabolically wicked. She really can do no wrong in my book. I don’t know if Divergent will live up to the success of some of the others in the young adult sub-genre, but it still works. It’s still better than Twilight in many regards. I am curious as to where the story is going to go next. My brother and husband had not read the book and still enjoyed the movie overall, so it does have an appeal outside of those who were already invested into the story. Is it worth your trip to the movies? Yes. 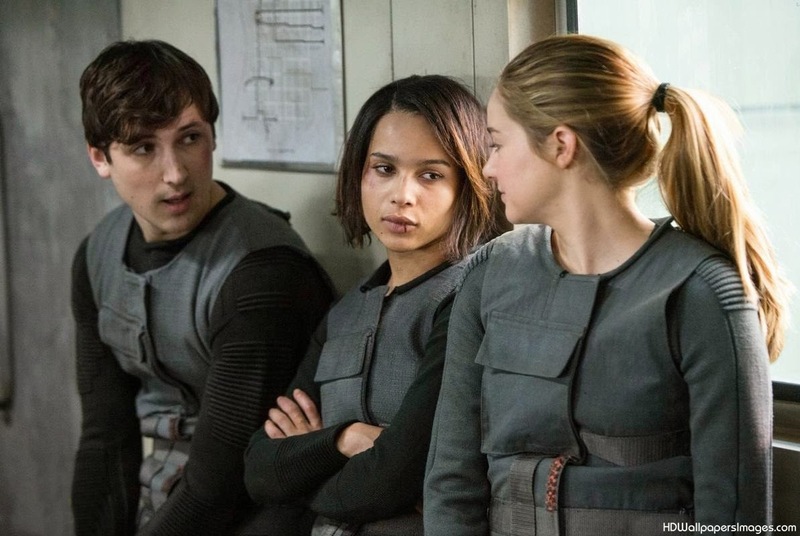 Even though it’s far from perfect, it’s talented cast led by Shailene Woodley make the film work better than many of it’s other competitors in the young adult sub-genre. You won’t feel completely lost if you haven’t read the books.